We are really thrilled to announce that we have just launched Inside Composites – www.insidecomposites.com – an exciting and dynamic news and information website for the composites sector. We have been publishing composites news and information here on our leading technical textiles website Innovation in Textiles since its launch in 2009, and with so many exciting recent developments in composites and with great things being predicted for the sector’s future, we felt that the timing was absolutely right to spin-out our composites coverage into the new Inside Composites website. We have copied the complete Innovation in Textiles composites archive (since 2009) across to Inside Composites to help get it off to a flying start and from now on all composites sector news will be posted to the new site. We are also delighted to tell you that well known and respected industry journalist and analyst Adrian Wilson, a regular contributor to Innovation in Textiles, will be the editor of Inside Composites. Adrian has covered the composites sector for a number of years and knows it very well and we are very excited about launching this new venture together. 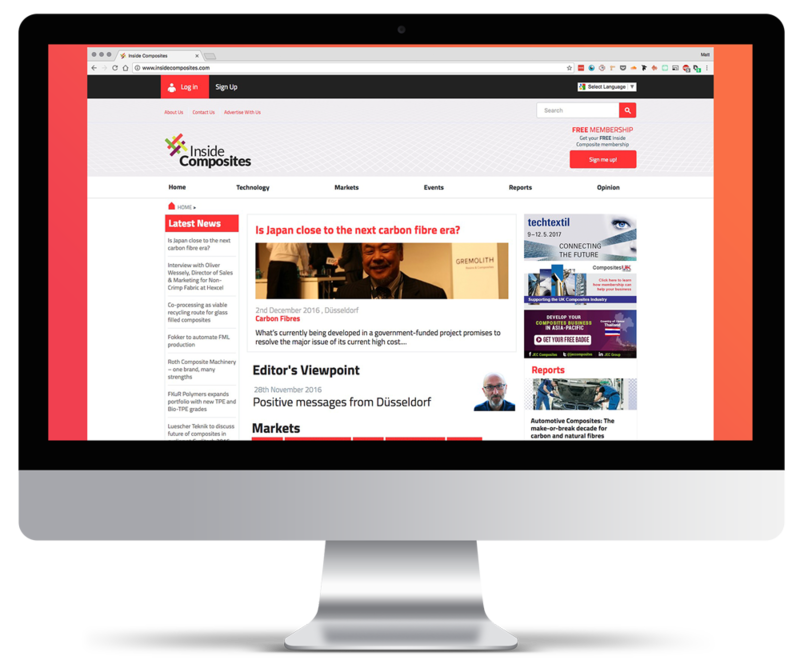 Inside Composites will follow the same format as Innovation in Textiles with daily news, views, comment and analysis, as well as features, interviews, events and reports and we will complement the site with customisable daily news alerts and a weekly e-newsletter, which you can access with your FREE Inside Textiles membership. Like all of our news websites, Inside Composites will be free to access for all readers – no subscription, no registration and no login will be necessary. Readers will be free to share content with colleagues and via social media. For those looking to promote their products and companies, our 2017 Media Pack is available now by visiting www.insidecomposites.com/advertise or by emailing Jane Smith at advertise@insidecomposites.com . We would love to have you onboard during our heavily promoted launch period. If you would like to submit your news or articles for consideration by our editor, please send to Adrian Wilson at editor@insidecomposites.com . We hope you enjoy using Inside Composites.